These Store Showcases are Stylish with a Frameless Design. This Display is Made of Tempered Glass. These Store Showcases Come in Many Styles and Sizes. 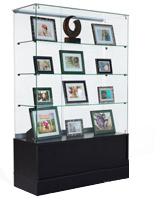 These store showcases with 4 glass shelved provide enough space for displaying items. 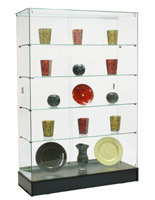 This glass cabinet is 15-3/4" deep to place an ample amount of items for display. 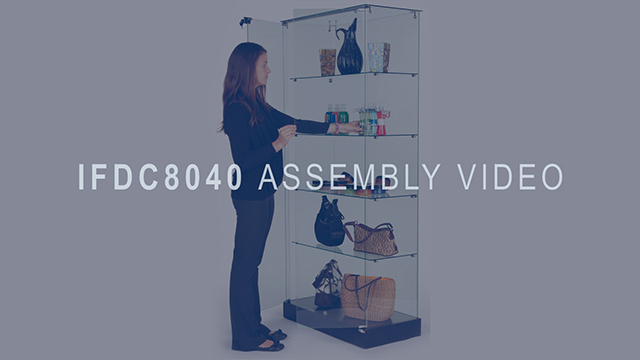 These glass cabinets, store showcases that ship unassembled are cheaper on shipping costs compared to pre-assembled models. Included with this display are paper instructions as well as a step-by-step video on how to assemble. These two door store showcases provide ample space for displaying jewelry, clothing, glassware, cameras, cell phones, cosmetics, and more! 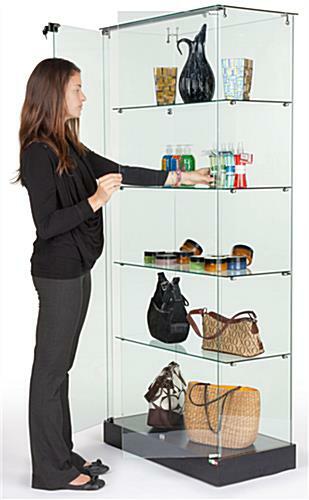 This retail cabinet is equipped with hidden wheels to make moving it around a store simple. In addition to these store showcases, there is a selection of counter top models also available right here! This display is great for custom items that demand attention. 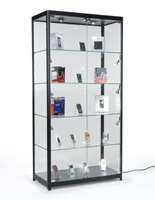 These store showcases are 71" tall and are floorstanding models. The black wood laminate over MDF (medium density fiberboard) makes these cabinets affordable. 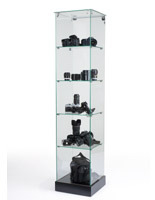 These store showcases that include tempered glass shelves have a European design. 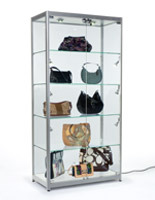 The locking glass doors ensure that only store employees have access to merchandise such as expensive diamond jewelry. These store showcases are the most affordable model yet and they have all the same great features as comparable displays. The tempered glass construction is stronger than comparative annealed versions. The swinging versus sliding doors adds elegance to these store showcases. Distance Between Shelves (bottom to top): 14-1/2"; 12-3/4"; 12-3/4"; 12-3/4"; 12-3/4"